BRUSSELS — Former France striker Thierry Henry was appointed as an assistant to new Belgium coach Roberto Martinez on Friday as the talent-packed team seeks to shake off its underachiever tag. Martinez, announcing his first squad since taking over from Marc Wilmots after Euro 2016, said that Henry, France's all-time top scorer and winner of the 1998 World Cup and 2000 European Championship, is "very keen to join and make sure he can pass on his experience." Belgium went into the European Championship in France as a title favorite, but was shocked by Wales 3-1 in the quarterfinals. Henry reacted to his surprise appointment in a tweet, saying, "Thanks to Roberto Martinez & the Royal Belgian Football Association. Very excited. Can't wait." As well as his international titles, the 39-year-old Henry won two league titles each with Arsenal and Barcelona, and the Champions League with Barcelona in 2009. 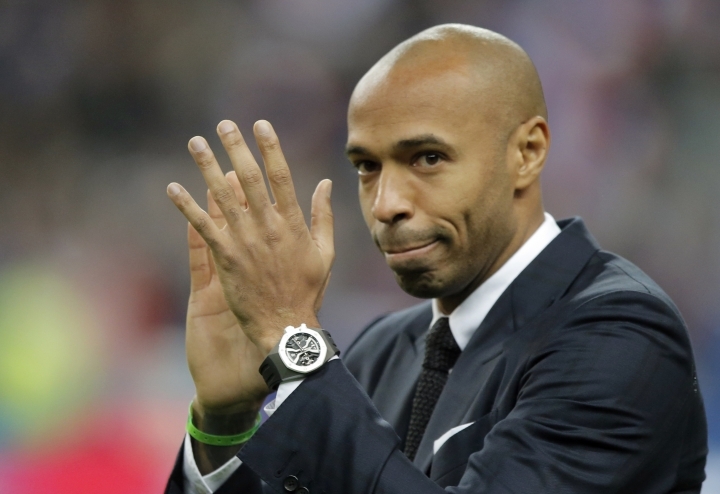 Martinez focused on Henry's role in the team that won the World Cup on home soil in 1998. "Thierry Henry brings something completely different," he said. "He's someone that has been in the situation of having to develop a mentality as a team. To change the dream of winning something special. He did that with his country back in '96, leading up to '98." Martinez's and Henry's first match on the Belgium bench is against the new head coach's home country, Spain, on Thursday in Brussels followed by a World Cup qualifier on Sept. 6 against Cyprus in Nicosia. While the management of the world's No. 2-ranked team has been revamped since Euro 2016, most of the players are the same, with Martinez hoping for a change of attitude instead of a change in personnel. "It is not about a revolution," Martinez said. "It is about evolving, about becoming closer to each other, and it's having real high standards and players that want to be very important for their national team." Goalkeepers: Thibaut Courtois (Chelsea), Simon Mignolet (Liverpool), Matz Sels (Newcastle). Defenders: Toby Alderweireld (Tottenham), Christian Kabasele (Watford), Nicolas Lombaerts (Zenit St. Petersburg), Jordan Lukaku (Lazio), Thomas Meunier (Paris Saint-Germain), Thomas Vermaelen (Roma), Jan Vertonghen (Tottenham). Midfielders: Kevin De Bruyne (Manchester City), Steven Defour (Burnley), Mousa Dembele (Tottenham), Marouane Fellaini (Manchester United), Radja Nainggolan (Roma), Axel Witsel (Zenit St. Petersburg). Forwards: Michy Batshuayi (Chelsea), Christian Benteke (Crystal Palace), Yannick Carrasco (Atletico Madrid), Eden Hazard (Chelsea), Thorgan Hazard (Borussia Moenchengladbach), Romelu Lukaku (Everton), Dries Mertens (Napoli), Kevin Mirallas (Everton), Divock Origi (Liverpool).